If you've been reading my 'Meet the Blogger' series then I hope you are enjoying it so far! This will be the last in the series for a few weeks but it will be back with new questions and new bloggers very soon! However, it's not over yet.. I predict big things for blogger Jade as she has a fab blog that deserves a lot more credit and a few more readers too! "Hey there, I'm Jade! 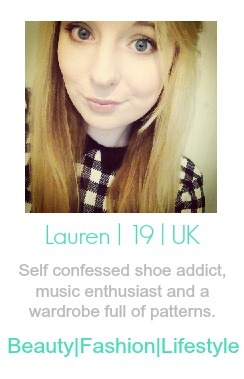 You can find me at skinsweet.co.uk where, like many others, I blog about everything beauty and fashion related. As a student, I am highly experienced in what the American's like to call 'drug store' products (I'm not even sure we have a name for that in England) and how to look good on a budget. Think more Seventeen than Sephora! If that interests you then make sure you stop by, after reading the lovely Lauren's post, of course." For the last couple of years I've been reading beauty blogs and watching these incredible girls on YouTube talking about things that they love and making something of it. I'm talking, of course, about people like Essie Button and Zoella. I just loved it and I wanted to be a part of it. I can't tell you how glad I am that I took that first step and created my blog, I'm still just as in love with blogging as I ever was. 2. What's your must have product at all times? I don't leave the house without lipstick in my bag, it's my must-have item. You never know where you're going to end up, especially with my friends, and a little lipstick can completely change your look! Suddenly you're ready for any occasion. That being said, I would never be caught not wearing concealer, I have the worst under eye circles! 3. Who inspires your style - fashion and make up choices? I'd be lying if I didn't admit to having certain people who's look I am always trying to achieve. Kate from gh0stparties is the top of that list for me, I love everything she wears both makeup and fashion wise. She's my absolute favourite! I think I favour bloggers over celebrities for inspiration. 4. Who's your favourite well known blogger? Again, Kate. It's always Kate. But I'm also loving Hannah from HannahMaggs and Judy from It'sJudyTime at the moment. Hannah's got such a naturally beautiful look that I can't help but be in awe, and now she's got her beautiful baby too! As for Judy, I watch her daily vlogs every single day without fail, I'm addicted! 5. And any underrated bloggers you think deserve more credit? LilyAnnLoves is my favourite at the moment and she absolutely knows it! 6. What is your favourite drugstore beauty brand? I'm loving Seventeen at the moment, since they've rebranded their products look much more high end. I particularly love their lipsticks. 7. And your high end brand preference? I really don't have anything from any high end brands, I can't afford it! If I was to splurge on something I think it would be Benefit, everything they do seems to be beautiful. 8. What's your favourite clothing brand? Online and high street? I shop almost exclusively with Topshop, it's just my favourite for both statement pieces and basics. 9. Got any blogging tips you have learnt? Write shorter posts! I used to, and something still do, write these crazy long posts when I could have said the same thing in a couple of sentences and kept my readers attention! 10. What are your hair styling secrets? Products? Electrical's? A good shampoo and conditioner with an intensive hair mask for the ends, every time I wash my hair. That's literally all I do most days, occasionally I use a little leave in conditioner or Moroccan oil if I'm doing something special. 11. And finally what do you want to achieve from blogging? I just want to keep going! Make new friends, go to meetups, get involved and just enjoy it. 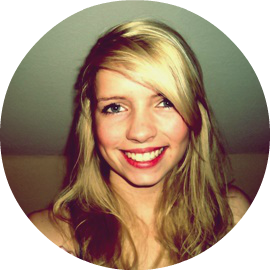 You'd be silly not to check out the lovely Jade's blog! If you want to take part in the next part of 'Meet the Blogger' you can find my email on my contact page for details!